Like most cities in the state, football reigns supreme in Katy, Texas. From Katy High School’s eight state titles, to the the district’s 70.3 million dollar stadium, the city is used to, and expects, success. Located 29 miles west of Houston, Katy has grown in size, now hosting eight high schools in the district, including Katy Tompkins, built in 2013. The Katy ISD board looked to make a big splash with their first hire, selecting Coach Tony Tademy in 2013. Tademy had spent seven years as TCU’s linebackers coach, before joining Duncanville’s coaching staff as an assistant, the year prior to taking the head coaching role at Tompkins. 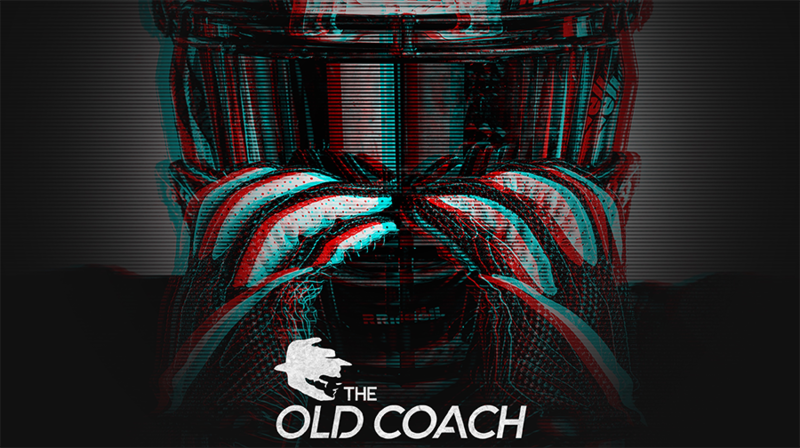 However, the well-traveled coach never lived up to the hype in his first tenure as head coach. Placed in a tough district with mounting pressure to be competitive early, the Tademy-led Falcons never took flight. After four seasons with only a 5-25 record to show for it, Tademy resigned and the Falcons were in dire need of a culture-builder. Little did they know that the man who would turn the program around was under their very nose. McVey had held the position of Assistant Athletic Director of Katy ISD since 2009. Prior to stepping away from coaching in 2009, he held Head Coaching positions at McKinney HS and Killeen Harker Heights. So after eight years away from the sidelines, why come back now? McVey was back and he knew the rebuild would be tough. Times had changed, but so had the tenured coach. His time in administration had allowed him to watch the successes of Katy under Gary Joseph and the development of other programs around the district. In his time, McVey watched four state championship runs. The situation McVey was entering was a rebuild in all facets. From the culture to the on-field product, things needed to change at Tompkins. The first task was building a patient, day-by-day mindset and a family atmosphere, a process that never ends. Second came instilling an emphasis on the weight room. Junior running back RJ Smith described a near “overnight” change in how serious the weight program was taken. The staff felt a change in the weight room would have a ripple effect throughout the rest of the program. Then came the task of figuring out how much talent the school had coming in and what to do with it. McVey found his quarterback of the future in incoming freshman Jalen Milroe. Sure enough, the Falcons experienced success early at the lower levels with the freshman team finishing 7-1-1 and the junior Varsity team finishing 8-1 in 2017. The varsity team on the other hand, was another story. Expectations for year one weren’t high by any stretch, especially after a 2-8 campaign in 2016, but no one could have expected what McVey’s debut season had in store. In game one, the Falcons fell short 24-17 against Porter. Games two and three were lost by one score. Then, Tompkins hit their low over the next four games, losing by an average margin of 40.25 points. In their final game of the year, looking to avoid a winless season, the Falcons ran out to a 28-14 halftime lead over Cinco Ranch. Entering the final 24 minutes of their season, Tompkins blew their lead, losing 35-28 to seal an 0-9 season. For the first time in program history, Tompkins didn’t win a single game, but the foundation had been laid. With the foundation laid, success in the lower levels and a new mindset, it was time to go to work. As the playbook continued to grow, so did the energy within the program. Milroe and the other underclassmen watched the winless season and were only motivated. Entering their sophomore year, Milroe and Adeleye were becoming leaders on their respective sides of the ball. All they had ever known was McVey’s culture and matched with their talent, they were ready to accelerate the rebuilding timeline. Expectations for year two weren’t high by any standard. Within the program, the brick-by-brick, day-by-day mentality didn’t stress immediate success but instead trying your hardest and leaving it all on the field. The team took it to heart, turning into the Cinderella story of 2018. September came around and the Falcons could not be stopped. 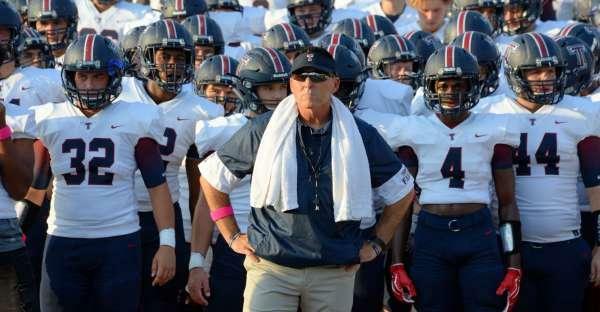 Just one year removed from a winless season, Tompkins could not lose, racking up wins against Fort Bend Austin, Klein Cain, Alvin, Clear Creek and Seven Lakes in the first month of the season. They were quickly brought back down to earth with a 66-13 loss against Katy. It stung, but the team wasn’t going to let one bad loss leave them reeling. Finishing October with three straight district wins, it seemed a historic playoff berth was in line for the young Falcons. One game out from the playoffs, Cinco Ranch got the best of Tompkins once again, this time by a score of 39-14. As magical as the season had been, it seemed the Falcons were still a level or two behind Katy and Cinco Ranch. However, it didnt take away from the fact that for the first time in school history, Katy Tompkins was in the playoffs. The Bi-District round touted the Falcons against a Fort Bend Elkins team that had finished fourth in their district. Tompkins made quick work of the Elk with a 35-20 win. Round two would prove to be a test. Cypress Falls had themselves a historic year and were considered one of the best teams in the state. Once again, it proved no matter for the Falcons who soared to a 31-21 win. Them came Beaumont West Brook. Played under the bright lights of NRG Stadium, there were no shortage of offensive fireworks. The Falcons sprinted out to an early 21-0 lead, scoring on their first three possessions. The Bruins didn’t back down, finally responding with a touchdown to carry momentum into the second quarter. By halftime, Tompkins’ lead had all but been erased as the Falcons only held a 24-21 lead. The second half was a true back-and-forth affair as Falcons running back RJ Smith and Bruins quarterback L’Ravien Elia were putting their teams on their backs. Entering the fourth quarter, Tompkins led 31-28. On the first play of the final quarter, West Brook scored, taking their first lead of the game 35-31. Both teams exchanged touchdown drives and with 6:41 left in the game, West Brook led 42-38. The Falcons weren’t backing down, as Smith scored for a 45-42 lead with just three minutes remaining. Then, just 60 seconds later, the Bruins scored a go-ahead touchdown to take a 49-45 lead. With just two minutes left to score, time would run out on the Falcons, who’s incredible season ended at 10-3 in the Regional round. The Falcons had fallen just four points short of the eventual State Runner-Ups, an incredible turnaround from 0-9 and yet, no one was satisfied. Milroe finished the year with 1420 yards and ten touchdowns through the air to go along with 609 rushing yards. Entering April, he holds six offers, including Houston, Florida State and Nebraska. Adeleye made the most of his varsity debut, finishing with 56 tackles and eight sacks. Through March, he holds 20 offers and is widely regarded as the best defensive end in the state for the class of 2021. McVey has emphasized to both of them, and the rest of the team that while the offers and the turnaround has been amazing, but the work doesn’t stop. Entering year three of the McVey era, there’s still work to be done but, the standard has been set. It’s still a learning process for McVey; the game, on and off the field, has changed since he last coached. McVey’s done what he can to emphasize the positives of social media. From promoting the progress being made to using the new connectedness to learn from coaches nationwide, he’s been very open to social media. Coach McVey continues to adapt to the times, but he’s quick to add that the game is still the game and if the work ethic is there success will follow. What he’s done cannot be understated. In just two years, he rebuilt the culture, turning a team that went 5-34 in their first four years to a regional playoff berth with presumably bigger and better things ahead. All that, after being away from the sidelines for seven years. If this trajectory continues, teams better hope to catch the Falcons now, because they’ll be competing for state titles soon.